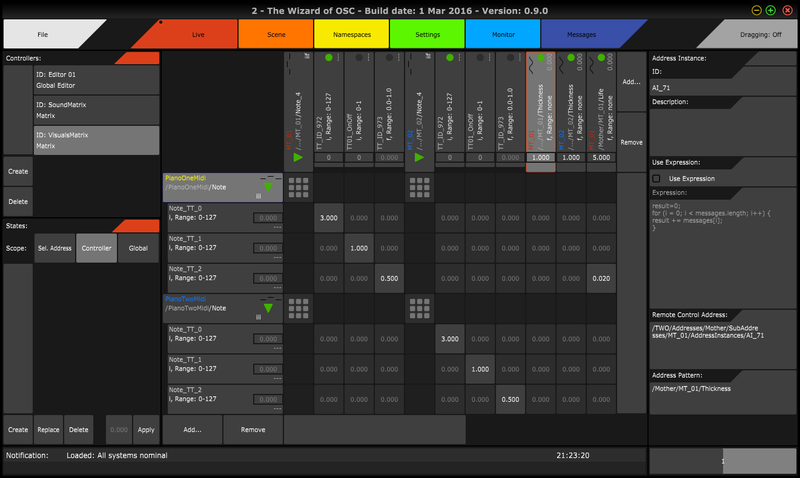 The Wizard of OSC (TWO) provides tools which together allow the recording, replaying, and creative manipulation of digital media control signals (currently MIDI & OSC) – be it for live sound, graphics, show control, or the Internet of Things. Its functionality is inspired by how live electronic musicians perform using a mixing desk and effects. Gradually create, alter and destroy fine-grained connections between all devices capable of transmitting and/or receiving MIDI and OSC. Quickly remote control all software and devices that can receive MIDI and OSC. Unlike previous controller software, TWO does not require that you first design a GUI, before being able to start using your devices. Save the state (presets) of individual devices, groups of devices, or even your entire set-up. Smoothly transition between such saved states, thus having direct control of the animation across large sets of parameters during performance. Re-route, and expand control message streams, splitting each into several, as decided following criteria you can define yourself. Automatically build the namespace of messages for any device transmitting to TWO. All types of messages can then be transmitted to that device from TWO’s controller GUI without additional effort – a feature unique to TWO. Record and replay streams of messages, from any number of sources, to any number of destinations. Unlike other OSC sequences, TWO allows recording any incoming message, irrespective of whether its address pattern is known or not. 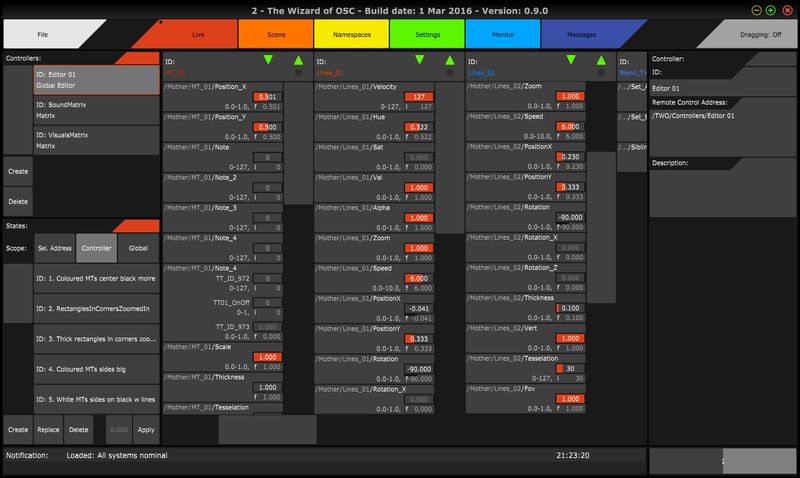 The Wizard of OSC has just been released for a first round of public Alpha testing! Head over to the Downloads page to grab the installer, for Windows and OS X! If you do not yet know what OSC is, follow this link for a summary, followed by a list of software and hardware tools which make great use of it. For an in-depth demo of TWO alongside its first audiovisual demo program, watch this video. Subscribe to the newsletter below, to receive notifications on all new developments on The Wizard of OSC!